For the first time since September 24, 2017, Powell River Villa SC lost a home game. Villa’s Vancouver Island Soccer League winning streak at Timberlane Park was snapped on Saturday, January 17. 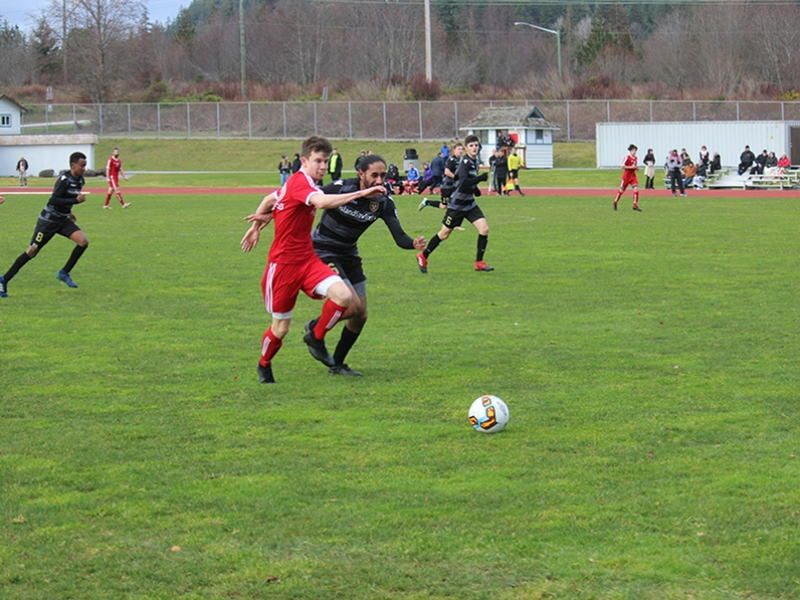 In a match between the two top teams in the division, Villa fell 3-2 to Victoria Highlanders U18's. The loss dropped Powell River from sole possession of first place atop Division 2, a position the team has held alone for the entire season, into a tie for first with the Highlanders, each with 28 points. Villa went into halftime ahead 2-1, but it all fell apart in the second half. Villa was on the scoreboard in the first half courtesy of a Highlanders own-goal, then Caleb Vallance scored his second of the season at the 12-minute mark on a beautiful assist from Jake Kenmuir. McDonough said Vallance was Villa’s best player and the best player on the pitch for both teams. Vallance said his play is just starting to come together and agreed it was his best game so far. Vallance has had to adjust to the men’s game from U16 with the Vancouver Island Wave, the team he plays for in the BC Premier League. He is playing against bigger opposition and faces tougher tackles in the VISL. Vallance created other chances for Villa and McDonough thought his team deserved at least a tie but could not find the finishing touch in the second half. Three points separate the top four teams in the division. Four games remain for Villa, with the next two on the road before returning to Timberlane Park for the last home game of the Division 2 season on February 9. Villa will look to get back to the win column against ninth place Vic West in Victoria on Saturday, January 26. McDonough will not have Vallance in his lineup. He will be in Vancouver to train with U17 Whitecaps residency program and play in a game for them on Saturday.